Nearing the end of her life, Meggie Tulloch takes up her pen to write a story for her granddaughter. It begins with the first years of the twentieth century, in a place where howling winds spin sat and sleet sucked up from icefloes. A place where lives are ruled by men, and men by the witchy sea. A place where the only thing lower than a girl in the order of things is a clever girl with accursed red hair. A place schooled in keeping secrets. This year there were two notable books that could be described as atmospheric. The first, for me, was Hannah Kent's highly anticipated Burial Rites. The second was Elemental. 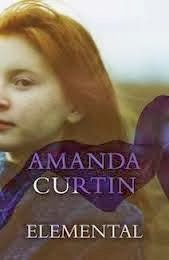 Written by Perth local, Amanda Curtin, this book takes its structure from the four earthly elements of Water, Air, Earth and Fire and travels almost the entire length of the globe, from Roanhaven Scotland, to Fremantle Western Australia. Like Annabel Smith's Whisky Charlie Foxtrot, Curtin's book is self reflexive and takes notions of story from it's inherent shape. Its four sections, Meggie's four notebooks, centre around their designated element. Notebook one is set in Roanhaven, a fishing village where social and familial cues are ruled by the water which is both a God and a Witch. Notebook two is set in the Shetland Isles where Meggie moves to be a gutting girl with her sister Kitta. Admittedly, this section to me also seemed to be water based, although the cold wind, the air, was a strong feature of this section as well as the notion of sailing away. This section of the book was filled with sadness as well as joyousness. Births, deaths and marriages. Misfortune. In notebook three, Meggie and her husband Magnus move to Fremantle, and later they are joined by Stivvy and Clementina who come to work the land. The land is cruel and unforgiving and shapes their lives in ways they had not expected. There is a war. Finally, fire. I could not see at first how this section would tie in. Surprisingly, the narrative jumps forward two generations, to when Laura (the lambsie for whom the story was written) is a mother herself. Laura's son Cooper (not, it seems, named purposefully for the profession of his Grandfather) is a firefighter who has been burned saving the life of a child. She waits by Cooper's bedside with his wife, Avril, and the pair of them bond over Meggie's journals which were withheld until now. The voice of Meggie Tulloch is strong and consistent. It is easy to imagine her sitting at her coffee table and writing these stories out for Laura. I could hear her voice as she spoke of quinies, our Kitta, Magnus Tulloch. As Avril says in part four of the book, "I feel as if Meggie is a friend." The short sections that diarise Laura and Meggie's interactions in the early 1970s are as heartbreaking as they are tender and familiar. But heartbreak is the central thread of this novel. No one gets what they want, all must make do. I was particularly drawn to the abundance of beautiful knitting metaphors throughout this book, and the skilled way that Curtin had Meggie liken human emotions and betrayal to the process of gutting fish. It feels as if Curtin has been Meggie, lived inside her skin and felt the things she felt. This was absolutely the best book of the year for me.